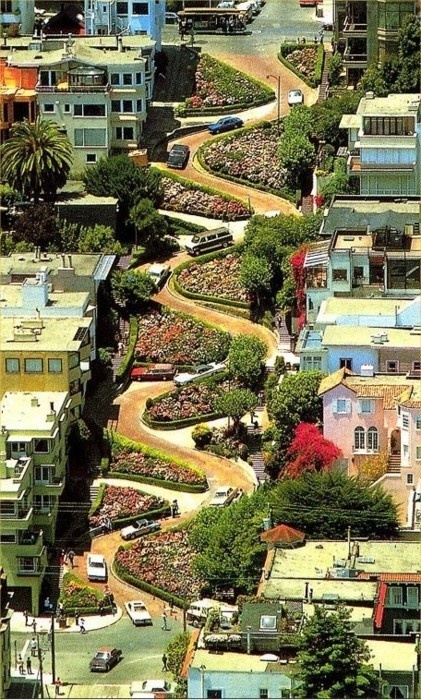 Lombard Street is best known for the one-way section on Russian Hill between Hyde and Leavenworth Streets, in which the roadway has eight sharp turns (or switchbacks) that have earned the street the distinction of being the crookedest (most winding) street in the world (though this title is contested - see "See Also" links). The switchback's design, first suggested by property owner Carl Henry and instituted in 1922, was born out of necessity in order to reduce the hill's natural 27% grade, which was too steep for most vehicles. It is also a serious hazard to pedestrians, who are accustomed to a more reasonable sixteen-degree incline. The crooked section of the street, which is about 1⁄4 mile (400 m) long, is reserved for one-way traffic traveling east (downhill) and is paved with red bricks. The speed limit in this section is 5 mph (8 km/h). Famous past residents of Lombard Street include Rowena Meeks Abdy, an early California painter who worked in the style of Impressionism.